Friend of MAKE, Stephanie “Von Awesome” Avery is a Toronto-based artist and maker. 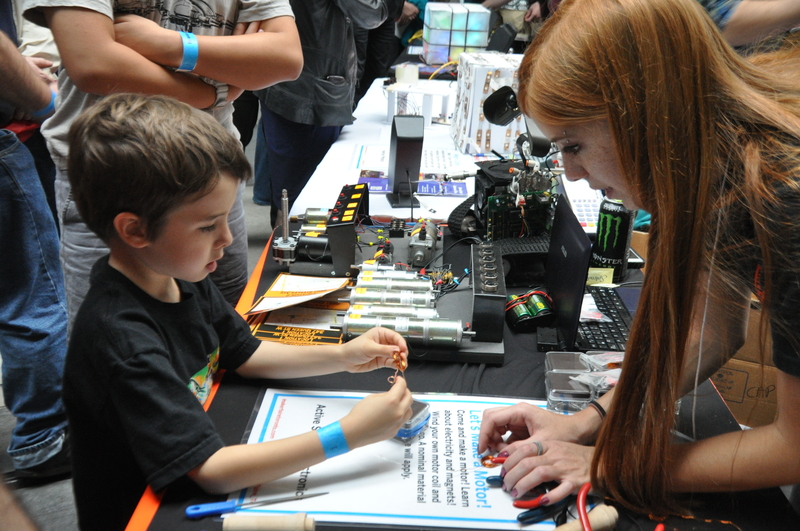 The 2013 Toronto Mini Maker Faire took place at the same time as the 4th annual World Maker Faire in New York City. Thankfully Stephanie was present in Toronto to take photos and report back. 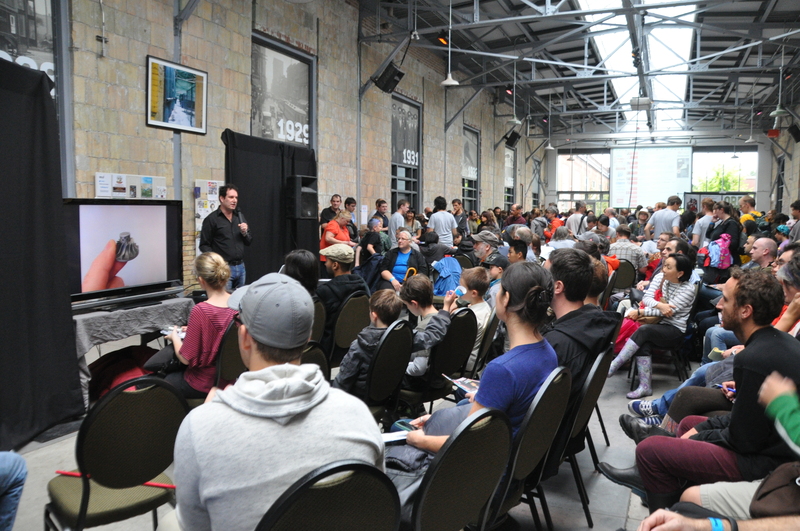 I’m a little embarrassed to admit I had never been to a Maker Faire or to Artscape’s lovely Wychwood Barns. 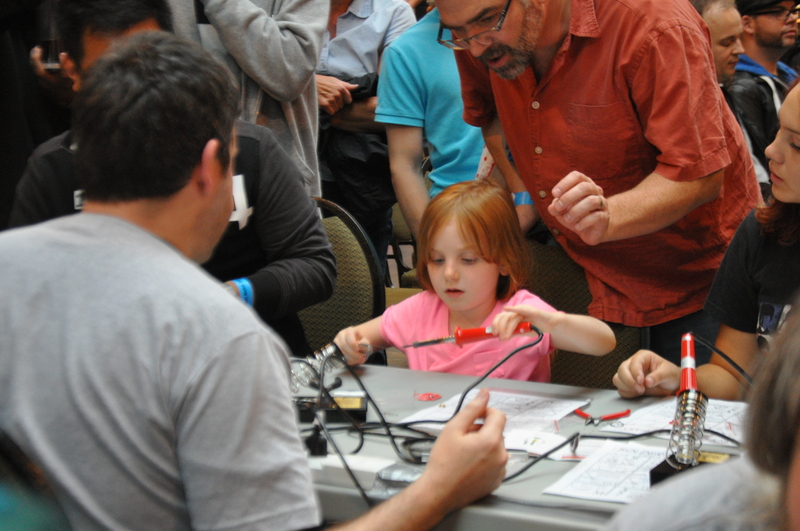 In my defense our Mini Maker Faire is still a baby event in Toronto, this was only our second one ever. I have no excuse for the Wychwood Barns, a beautiful hundred-year-old streetcar maintenance facility that, since being renovated in 2008, has become a hub for local cultural events. Better late than never, and with Maker Faire being hosted by Wychwood Barns, I was hitting two awesome birds with one spectacular stone. The weekend of September 21 and 22 was cold, rainy, and dreary. 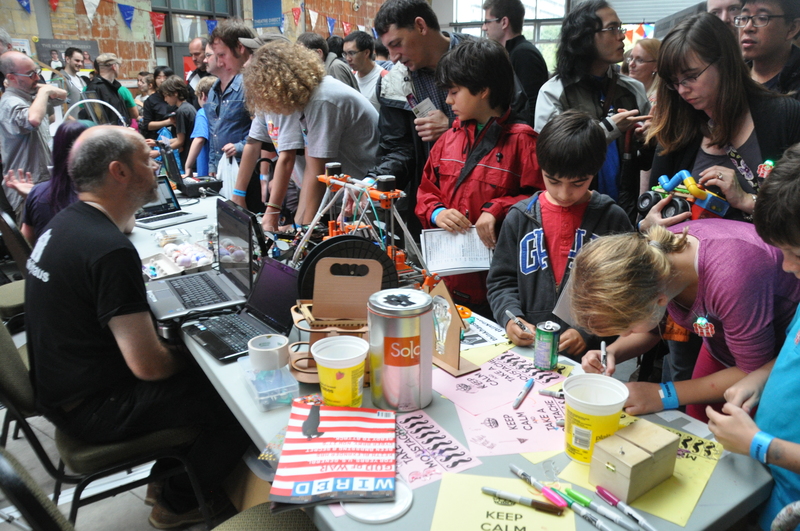 Recalling that our first Maker Faire back in 2011 was relatively small I was worried the combination of bad weather and lack of local Maker-awareness would make for lackluster attendance. I couldn’t have been more wrong. The event was jam-packed. 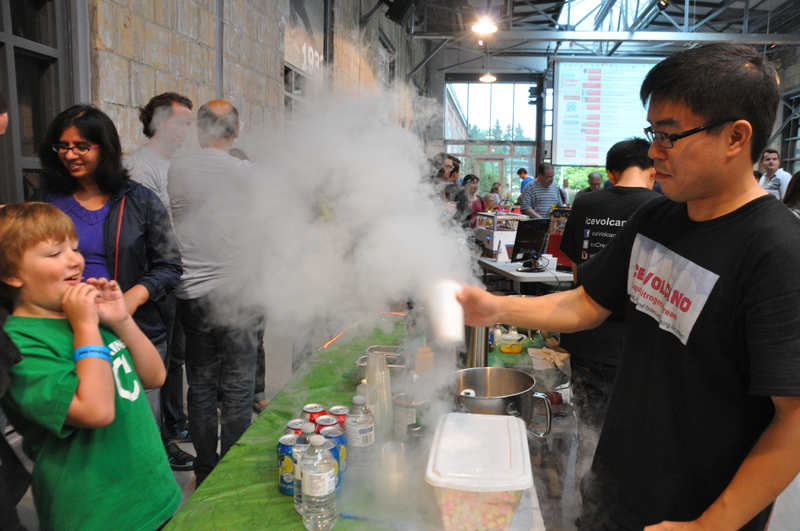 With 3D printers as far as the eye could see, interactive activities to appeal to even the most scientifically reluctant mind, compelling talks, tasty treats, and so much more, Wychwood Barns was full of people having a great time. Every table had interactive elements, though they were so busy that oftentimes it was a struggle to get close enough to play (not that I’ll ever complain when this many people are this eager to participate). Hamilton-based hack, craft, and DIY space Think|Haus had, among other things, a 3D printing demo, a printer programmed to draw designs onto eggs (‘Eggbot’), fun homemade motors, and hundreds (maybe thousands) of laser-printed, wearable mustaches for us to colour and wear. At the Site3 CoLaboratory table, while Jeffrey Wick played the Pianocade (a chiptunes synthesizer made of arcade components) Jonathan M. Guberman explained that if you use a 3D printer to print the plastic components of a 3D printer, the cost of making your own 3D printer can be as little as $500. What a bargain! 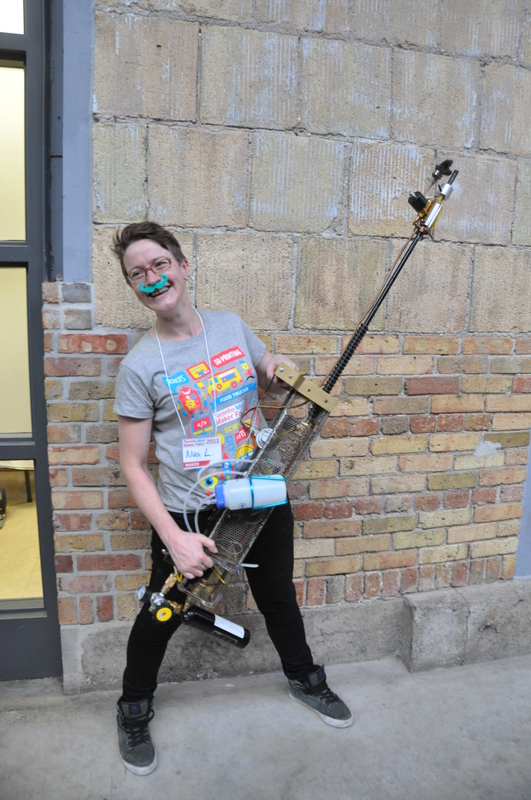 Alex Leitch, also of the Site3 CoLaboratory, showed off her epic homemade multi-colored flame thrower. Much to everyone’s disappointment we did not get a demonstration of its capabilities. But if any Torontonians reading this are thinking, “I sure would like to make my own epic flamethrower”, fret not! Site3 has open houses every Thursday night, so say hi and get learning. Words cannot describe the glory that is Active Surplus, though their website does a pretty good job of it as “a museum, workshop, garage sale and hardware store”. It’s my favorite shop in Toronto and I was a little giddy to see they had a table at Maker Faire. Here little Danu is being taught how to make his very own motor. Right smack in the middle of the craziness was a presentation area where guests were rapt by such topics as The Future of 3D printing (pictured), the Toronto Tool Sharing Library, 3D Printed Chocolate: Food for the Future, and a pitch session for the Toronto Awesome Foundation. 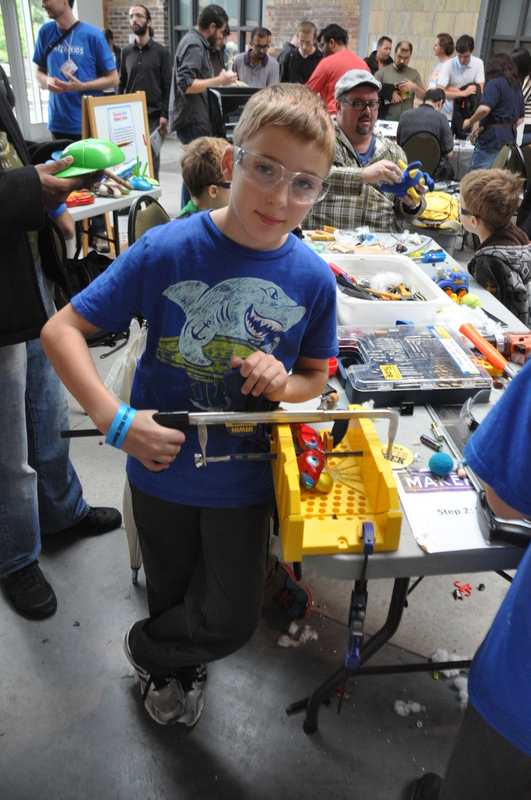 I could have spent hours in the Toy Hack area watching kids unleash their creativity on the poor, unsuspecting toys. Max here was decapitating a plastic parrot to “put it on this contraption for a balloon popper robot to pop balloons”, hoping to eventually put a speaker in it’s mouth that could play custom recorded sounds bytes. 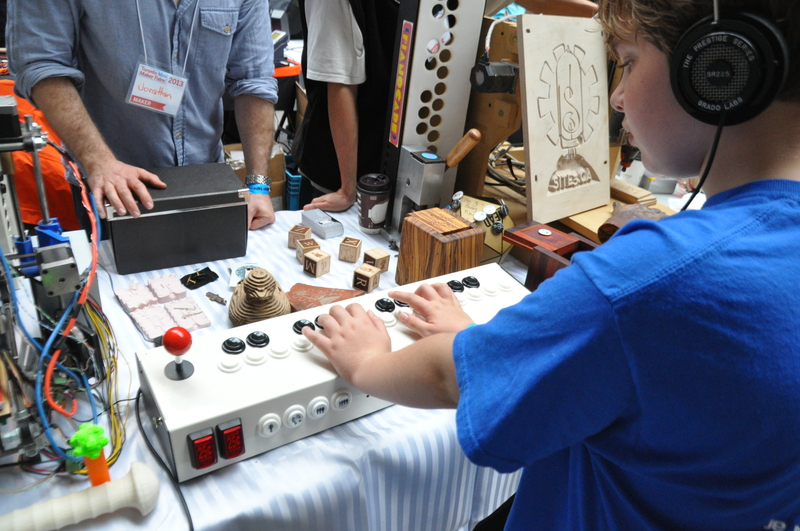 Kids at Maker Faire are pretty much the best. 3D printing is revolutionizing so many different industries. 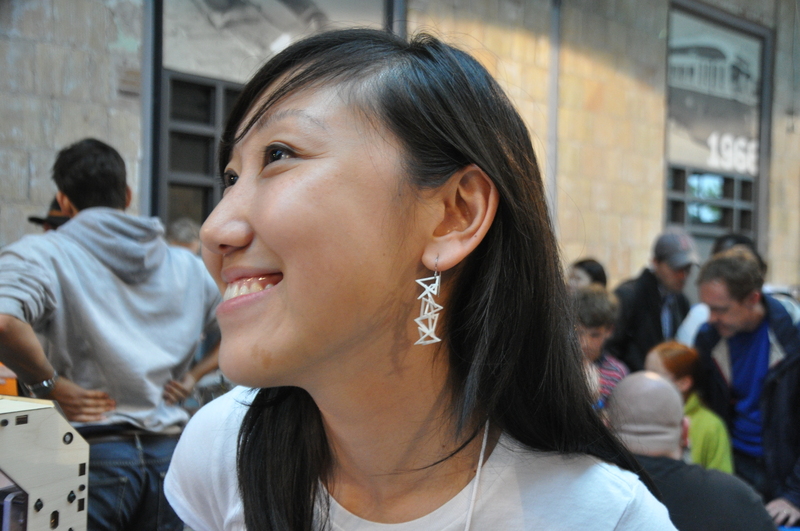 At the Hot Pop Factory table Bi-Ying Miao shows off a pair of her 3D printed earrings. Lockpicking was one of the most popular attractions of the faire. Theoretically it’s a practical skill to learn, you never know when you’re going to accidentally lock yourself out of the house or lose the key to a padlock. I’m pretty sure, though, that everyone who tried their hands at this imagined themselves as a dashing secret agent or suave bank robber or something a lot more exciting than boring practicality (I know I was). For the record, it’s a lot harder than it looks. 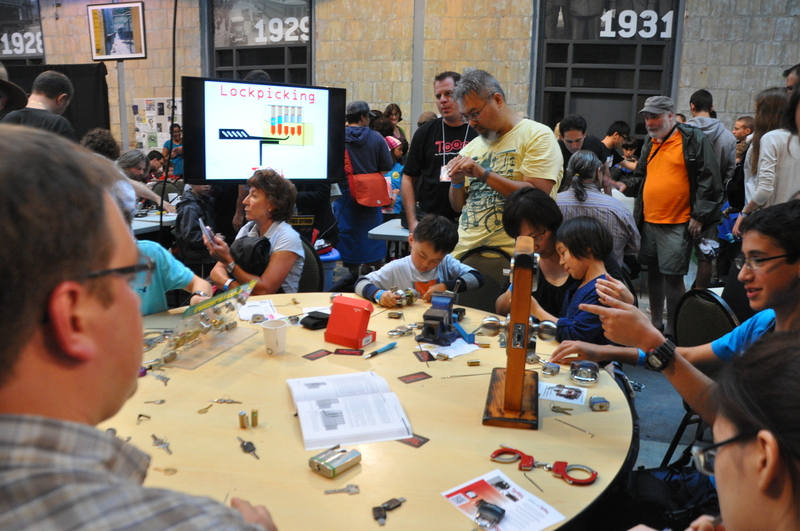 Also, there are few things more endearing than parents and children learning the art of lockpicking together. 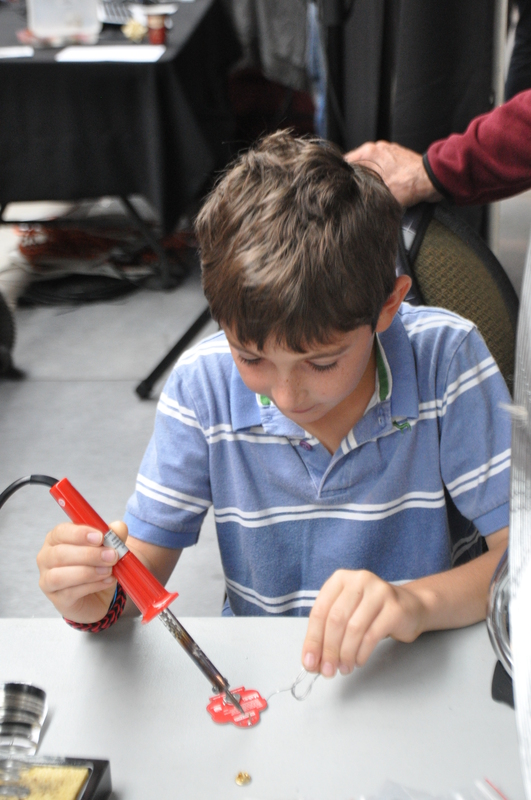 You’re never too young or too old to learn soldering. 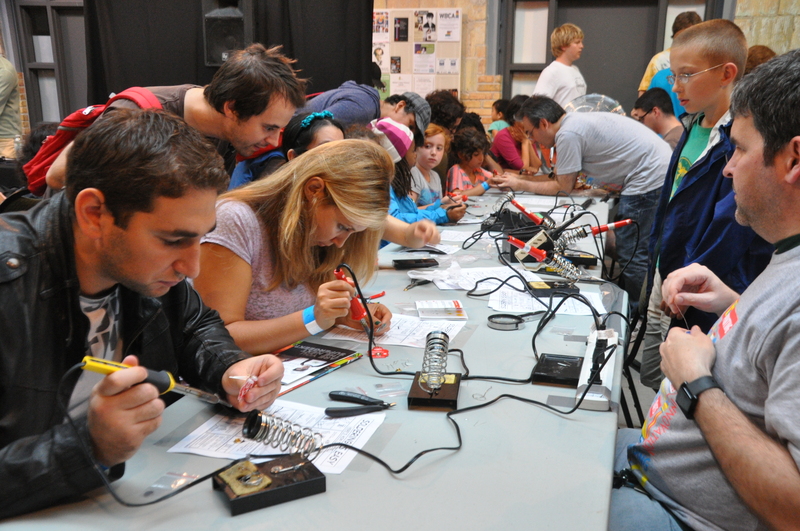 Here, under the watchful eyes of skilled volunteers, we could make our own light-up Makerbot pins. 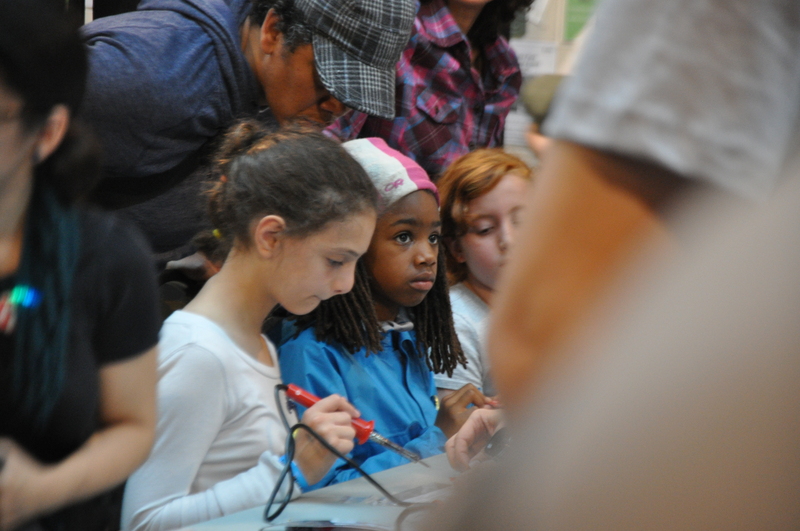 And, because nothing is cuter than a small child soldering, I’m going to end this post with some adorable shots of our future makers. 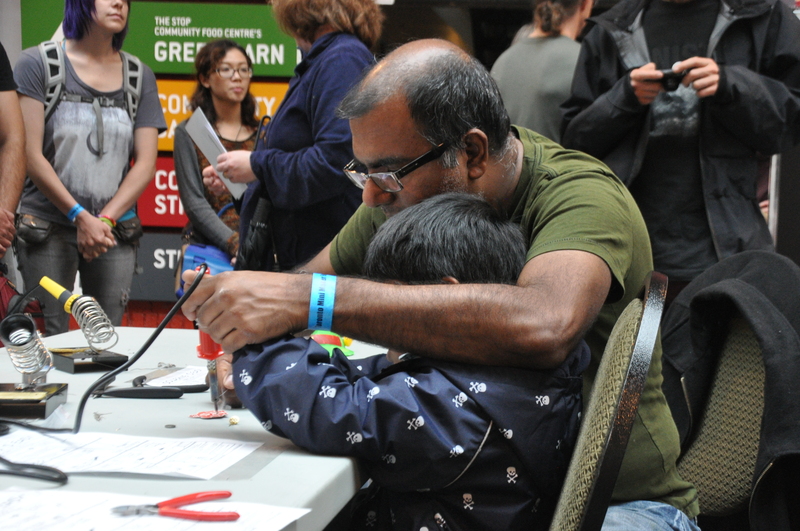 Despite my limited Maker Faire experience I think I can safely declare the Toronto Mini Maker Faire a resounding success. If it continues to grow the way it has, pretty soon we’ll be able to remove the ‘Mini’ and have a full fledged Maker Faire of our own.